Dark Matter is getting ready for its third season on Syfy, and there are few teasers now available for the action ahead on the science-fiction series. Joseph Mallozzi, the creator of the series, offered a few teasers in an interview with Geektown. He didn’t give too much away, but he did reveal that the series will not have any new season regulars next season. There is definitely more danger ahead for those in the Raza crew – at least those crew members that managed to survive that huge explosion that ended season two. 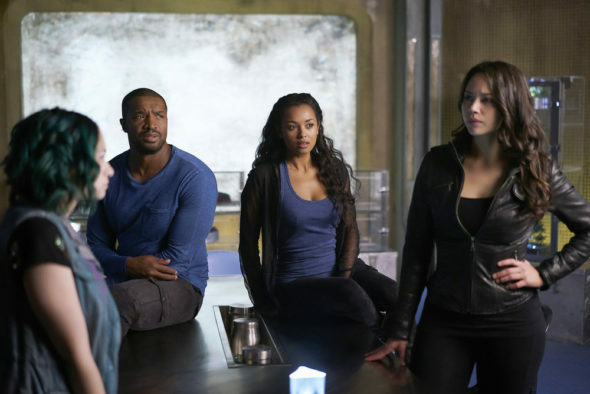 Are you excited for the return of Dark Matter? Tell us what you think. I hope this show gets renewed for several seasons. There are very few shows that the whole family can watch. Love the cast and plot. This is a state of the art mesmerizing show with a beautiful cast of characters. Keep going. Love the show. The cast is great. I love the action and the camraderie of the crew. I like the show. Knowing each persons personalities and reasons for their decisions keeps the show interesting. I expect the Ratings to DROP AGAIN! That’s what SYFY shows do from year to year. The real question is if SYFY will cancel it once it does what Wynonna Earp or 12 Monkeys did last season for ratings? I’d love a job where FAILURE doesn’t get you fired, and pays you 6 or 7 figures a year.